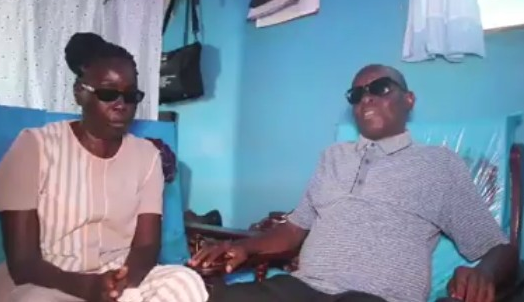 An interesting and unique blind couple who have been married for 40 years, told their love story which has gotten the attention of social media users across the world. Augustine Marfo and Juliana Agyeiwaa who met in 1970, have 4 children including an adopted child from the woman’s late sister. It was further gathered that none of their three biological children has any problem with his/her sight. Their eldest child is 33 years, followed by another who is 29 and the last child is 27 years old. In the clip shared online, Juliana who does the cooking without any assistance, was spotted using knives as good as anyone with sight will. Augustine Marfo who on the other hand can also operate his TV set and radio without assistance, mainly listens for political, lifestyle and entertainment news. The husband was not born blind; he reportedly got sick at a tender age which resulted in his blindness. The couple has never seen each other’s face but they have loved each other like no other else.